I mentioned earlier that going raw is a lifestyle change and one of the things that has made a vegetarian lifestyle so convenient for us, is the availability of snacks (healthy and otherwise) that are abundant everywhere – supermarkets, petrol stations, corner shops, at local attractions – you will always at least find a muffin, ice-cream or hot chips that you can eat. Now that I am beginning to look at the world through “raw glasses”, taking the kids out and about is proving to bring up new challenges. Being a family of 6 means we need to watch our pennies a bit, so in the past, I have often found myself throwing together peanut butter sandwiches or popping apples and bananas in a bag as we rush out the door. Lately, I have been trying to have something a little bit special and a bit “more raw” and definitely vegan, to snack on when we are out. 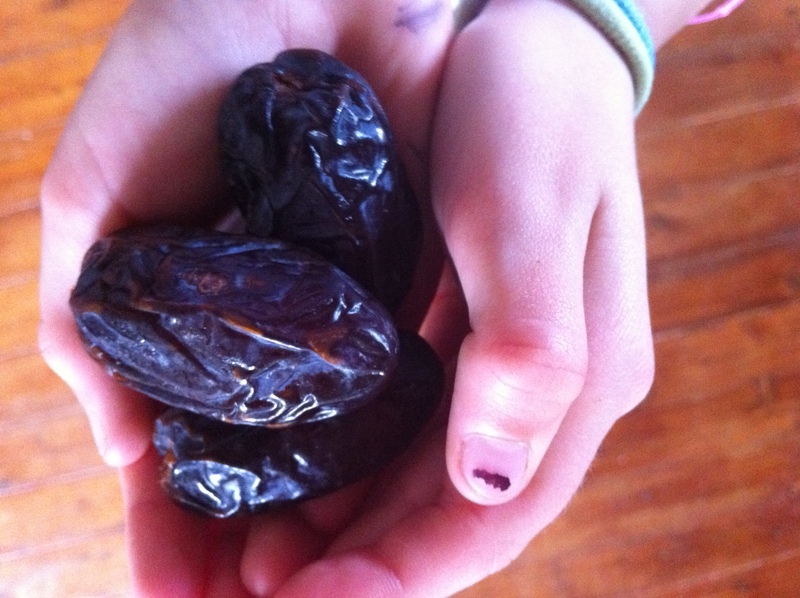 Medjool dates: Full of fiber, vitamin A, antioxidants, iron, potassium and calcium, (just to name a few) are a yummy, fresh, sweet treat and are easy to find in most supermarkets as well as local fruit and veg shops. We eat them as they or we feel like a bit more of a confectionery hit, the kids pop them in the fridge or freezer. They go nice an chewy in the cold, very much like caramel. Or for something a bit different, take out the pip and stuff with a walnut or two, yum! “Frogs on a Log”: an idea my son saw on Play School. My kids really like making and eating them. 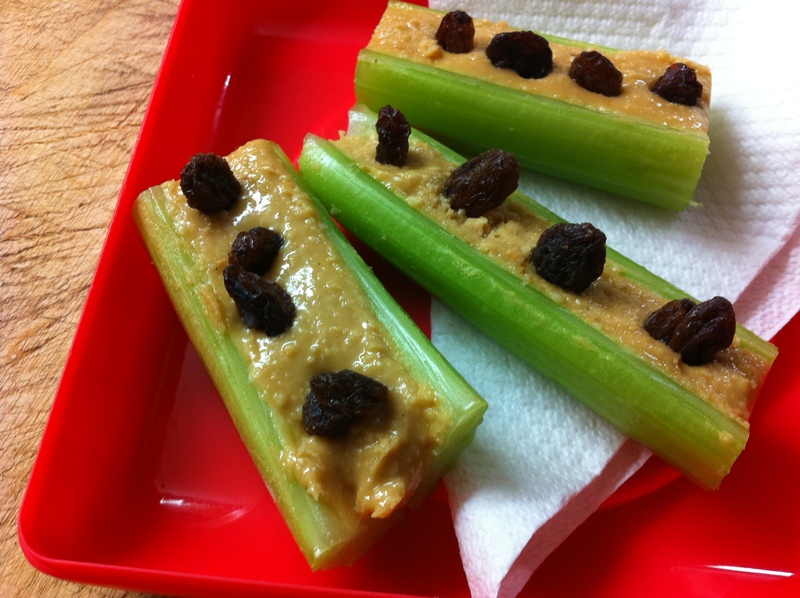 Cut celery ribs to about 3 cm in length, fill the center with peanut butter (you can make your own raw nut butters easily enough, recipes to come! 😉 ) and top with sultanas. Pop in an air-tight container and take them along with you. 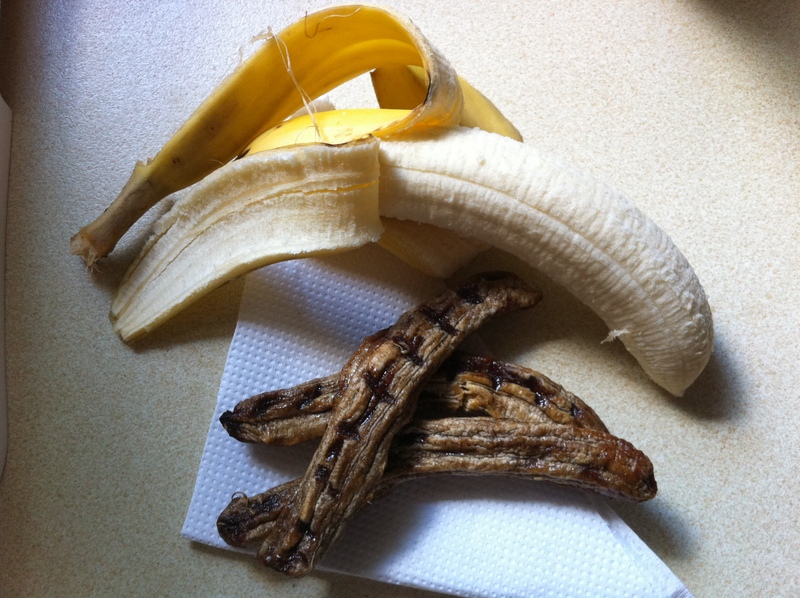 Dried Bananas (and other fruit): my kids love these! Dried bananas are the ugliest looking things, but are so yummy, it totally makes up for it. When choosing dried fruit, I do my best to make sure I get the stuff that is “unsulphured”. If you’re lucky enough to own a dehydrator you can make your own, but I have found that most health food shops carry unsulphured, sundried and organic dried fruits. Don’t over-dose on dried fruits though, they are dehydrating to our bodies. Check out The Wellness Worrior Jess Ainscough’s blog for a really good explanation as to why we need to go easy on dried fruits, as well as some good tips when using dried fruits. Kitz Living Foods: I was really excited to find these the other day when I was in Bondi. They make a variety of yummy snacks – activated nuts, crackers, granola, convenience bars plus heaps more healthy stuff, “free from artificial colours, preservatives, flavours, wheat, gluten, dairy, eggs and 100% vegan. All products are dehydrated at a low temperature to preserve the enzymes and nutrients of the ingredients”. You can find them in selected health food stores all over Australia or you can order on-line. So keep some in your cupboard and a packet in your bag! Check out Kitz Living Foods website! Grab an Apple! A pear, bunch of grapes, punnet of organic strawberries….. The list is endless and (I reckon), the most obvious thing to do. 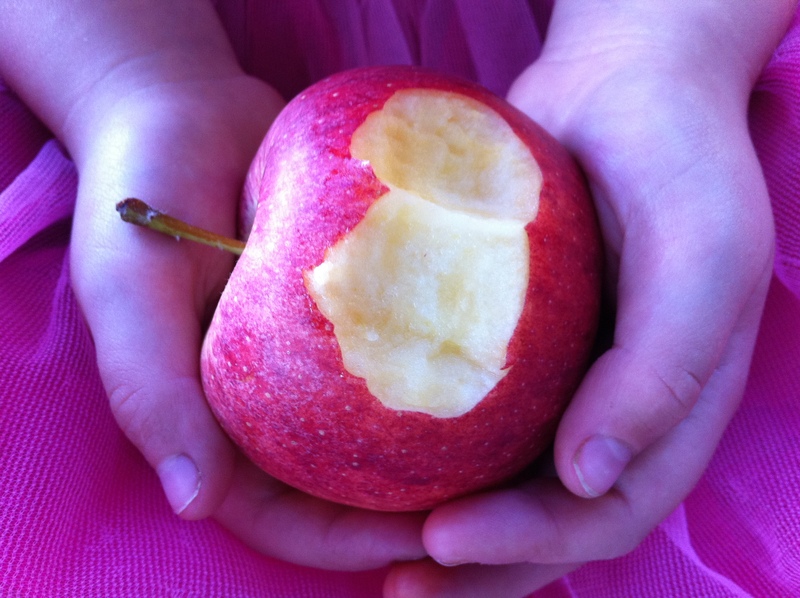 Fresh fruit is the ultimate fast food, no prep, pre-packaged and very little to throw away! Grab something quickly from home to take along with you or otherwise there is always a great variety of fresh fruit available and any supermarket when you’re out and even a lot of cafes have whole pieces of fruit for sale if you haven’t packed your own. 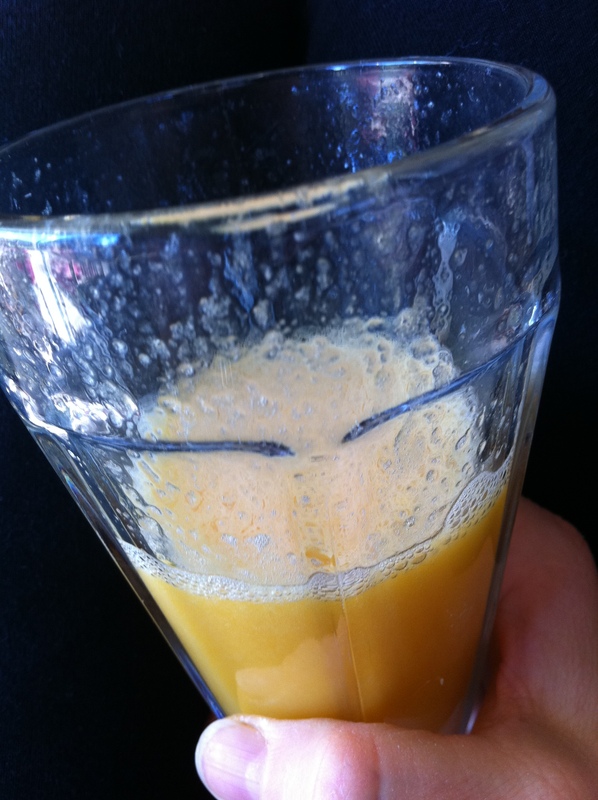 Freshly Squeezed: Fresh juice & smoothiebars are everywhere, food courts, shopping centers and cafes. They can be slightly more expensive, but are very filling. I am careful if choosing a smoothie, even though most places offer non-dairy milks or no milk options, some use syrup instead of actual fruit. Also, if ordering a smoothie with non-dairy milk, be aware that they may still add the ice-cream or yogurt, (something I came across recently). So ask before ordering. 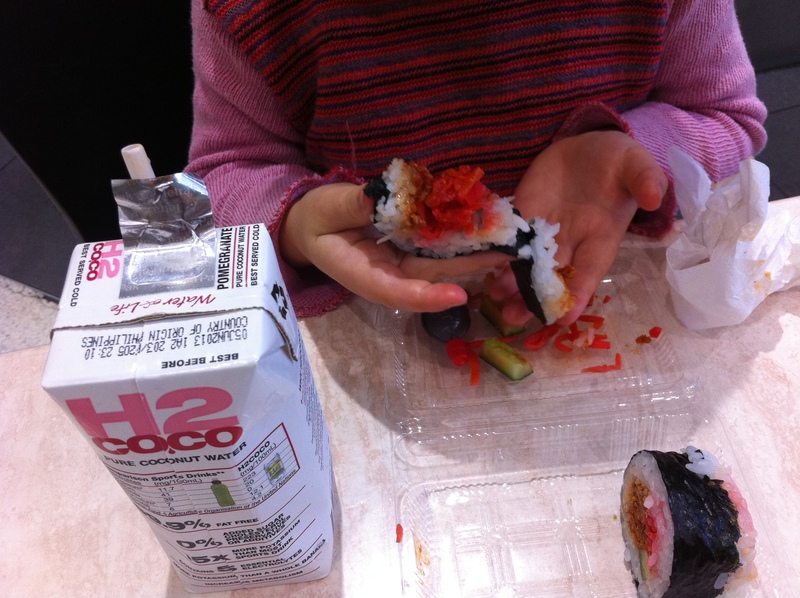 Sushi: is the another food I like to buy my kids when we’re out. I know it’s not completely raw, but there are plenty of vegan options. My kids love it and the big bonus is they actually eat it! A good sushi bar will make the sushi with brown rice to order, which is the better alternative. If all else fails? I order a salad, either fruit or vegetable. Even the local “chipper” (Australian for fish and chip shop 😉 ) has salad on the menu! My other go to is a salad wrap. So my rule is, if I can’t always bring food from home, go for the most raw, vegan, natural alternative and I am learning not beat myself up about it. We can always have a green smoothie when we get home! This entry was posted in Uncategorized and tagged air tight container, apples and bananas, celery ribs, fruit and veg, peanut butter sandwiches. Bookmark the permalink.